Tessa Longbons | October 8, 2018. 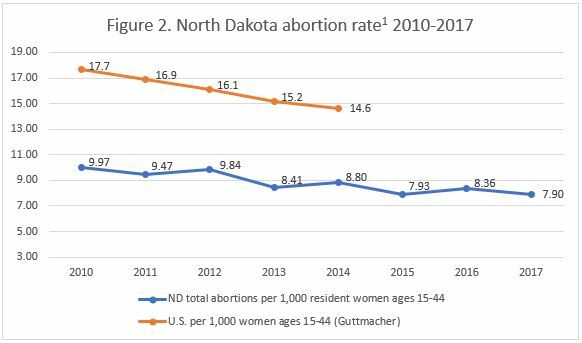 North Dakota’s 2017 abortion report, published in August 2018 on the North Dakota Department of Health’s website, shows that abortion in the state is trending downward. Just one abortion center operates in North Dakota. *Information on North Dakota’s state abortion rate and Planned Parenthood’s North Dakota market share is not publicly available. However, Planned Parenthood operates no abortion centers in North Dakota. In 2017, there were 1,155 abortions reported in North Dakota, a drop of six percent from the previous year (Fig. 1). Abortions in North Dakota have fallen by seven percent from 1998, the earliest year with information available online. North Dakota does not report the state abortion rate, but the Charlotte Lozier Institute (CLI) estimates that the abortion rate fell slightly from 8.4 abortions per 1,000 resident women of childbearing age in 2016 to 7.9 in 2017 (Fig. 2). North Dakota’s abortion report does not include information on the types of abortion procedures performed. However, data provided to CLI by the North Dakota Department of Health show that chemical abortions rose by 28 percent from 2016 to 2017. 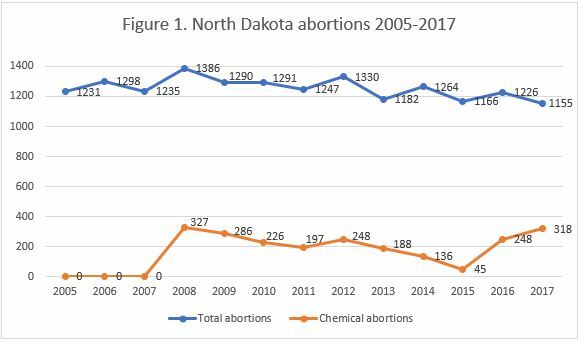 There were 318 chemical abortions reported in North Dakota in 2017, equal to 28 percent of all abortions reported in the state. In 2017, a total of 73 percent of all abortions reported in North Dakota were performed on state residents. An additional 316 abortions were performed on women from other states, including 261 women from Minnesota. More than half of the abortions, 58 percent, were performed on women in their twenties. Twenty-nine percent of women were in their thirties and three percent were age 40 or older, while 10 percent were under the age of 20. A majority of abortions were performed on women who had graduated from high school. A third of the women reported a high school diploma as their highest level of education, while 12 percent had completed some college but had not yet attained a degree. Thirty-nine percent had an associate’s degree or higher. Consistent with trends in other states, a large majority of the women undergoing abortions were unmarried (83 percent). Seventeen percent were married. More than half had previously given birth – 21 percent had one living child, and 38 percent had two or more living children. Almost two-thirds of the abortions reported in North Dakota were performed on women who had never had abortions before. Twenty percent had one prior abortion, and 14 percent had two or more. White women made up the majority of women undergoing abortions, accounting for 69 percent of the abortions reported in North Dakota. Black women composed 15 percent of the total, and Native American women made up 10 percent. Overall, white women make up 87 percent of North Dakota’s population of women of childbearing age. American Indian or Alaska Native women are seven percent of the population of women of childbearing age, and black women are four percent. The majority of abortions in North Dakota are performed early in pregnancy. In 2017, 65 percent of reported abortions were performed at eight weeks of gestation or earlier. Twenty-six percent were performed between nine and 12 weeks, and eight percent were performed at 13 to 15 weeks. There were 16 abortions at 16 weeks of gestation or later. North Dakota prohibits abortions after 20 weeks post-fertilization, approximately 22 weeks of gestation, unless the mother’s life or a major bodily function is at risk. North Dakota has just one abortion center. Located just blocks from the Minnesota border, Red River Women’s Clinic advertises chemical abortions up to 10 weeks of gestation and surgical abortions up to 16 weeks of gestation. Archived versions of the clinic’s website show that the clinic first began advertising chemical abortions in 2008. Since then, chemical abortion totals have fluctuated from year to year. Abortion providers in North Dakota are required to follow Food and Drug Administration (FDA) guidelines when performing chemical abortions. In 2016, the FDA guidelines were updated to require only one office visit in contrast to the three that were necessary under the old protocol, which could have contributed to the uptick in chemical abortions after 2015, when it had reached an all-time low following years of decline. North Dakota has taken steps to protect life. In 2013, the state passed a fetal heartbeat law prohibiting abortions after six weeks; the law was later blocked by the U.S. Supreme Court. North Dakota also attempted to enact an amendment to the state constitution establishing that personhood begins at conception. The state legislature voted to place the amendment on the ballot for voters to decide, but the amendment failed to pass with 36 percent of North Dakota voters in favor and 64 percent opposed. In a CLI study of state abortion reporting, North Dakota’s reports tied for 19th best out of the 50 states, New York City, and the District of Columbia. North Dakota could increase its transparency by reporting more of the information it already collects, including complications that result from abortion; the state’s parental and informed consent processes; and whether any abortions were performed due to medical emergencies. Similarly, North Dakota could provide more specific information on gestational age, including whether any abortions were performed after 20 weeks. Additionally, North Dakota could collect more data to provide a better understanding of abortion in the state, such as women’s contraceptive history and reasons for choosing abortion as well as whether any unborn children were viable. As the Peace Garden State continues to work to protect life, more detailed reporting could allow North Dakotans to tell whether their efforts are having an impact. North Dakota does not report the state abortion rate. Rates were calculated by the Charlotte Lozier Institute using population estimates from the United States Census Bureau. The rates were calculated using the following formula: (total number of abortions performed in North Dakota ÷ number of resident women ages 15-44) x 1,000.